Eclectic Arts Reviews “Compound Fracture” 9/13 – Omaha, NE COMPOUND FRACTURE joins Creature Feature Live! 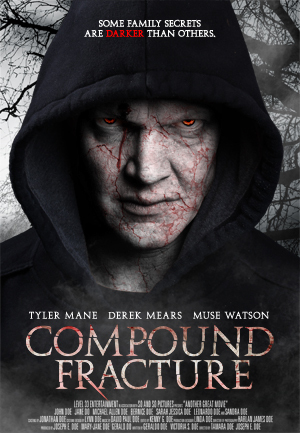 Tyler Mane and Mane Entertainment bring their US and Canada screening tour of thriller COMPOUND FRACTURE to the Hot Springs International Horror Film Festival. Night includes exclusive limited screening and meet & greet event, plus a chance to win many prizes including a role in Mane Entertainment’s next film. Los Angeles, CA. – Actor Tyler Mane will screen his new film, Compound Fracture, September 28th,. 10:00 pm at the Central Theater in Hot Springs, AR. Mane, known primarily for his acting career (his credits include, Michael Meyers in Rob Zombie’s Halloween & Halloween II, Troy, The Scorpion King, Joe Dirt, X-Men), co-wrote, produced and co-stars in this new thriller. Ticket holders are invited to stay for Q & A with Mane and writer Renae Geerlings (previously the Editor in Chief at Top Cow Comics). Limited tickets are also available for a private post-show event. Get up close and personal with Mane at the intimate VIP preshow that includes a meet-n-greet, photo opportunities and signing. Watch a “behind the scenes” featurette before the film and then partake in a candid discussion with Mane and Renae after the film about the “making of.” VIP Ticket holders to this special event will be automatically entered into the nightly prize drawing as well as the grand prize drawing to win one of several prizes: a walk-on role in Mane’s next film, Penance Lane, or a screen-worn Michael Myers jumpsuit from the Rob Zombie cult-classic film, Halloween, and more. Other prizes include props and costumes from the film Compound Fracture. Compound Fracture is a character-driven supernatural thriller in the vein of Rosemary’s Baby, Amityville Horror and The Legend of Hell House, revolving around a family, dealing with abuse, abandonment and dementia, that is stalked by a vengeful spirit. The film culminates in a bloody, Battle Royale between the actors who played Michael Myers (Mane), Jason Vorhees (Derek Mears, Friday the 13th) and Ben Willis (Muse Watson, I Know What You Did Last Summer). Because of the grass roots, word-of-mouth campaign that Mane Entertainment is employing, Mane and Geerlings are giving ticket buyers the option to make each event a one-of-a-kind personal experience. Shot in Los Angeles, Compound Fracture also stars Leslie Easterbrook (Devil’s Rejects), Todd Farmer (Jason X), Daniel Roebuck (John Dies at the End), Alex Saxon (The Fosters), Susan Angelo (Jack Reacher), and Renae Geerlings (Halloween II). Directed by Anthony J. Rickert-Epstein and produced by Mane’s production company, Mane Entertainment, Compound Fracture will screen in select cities across the country through the end of the year. Michael Wolffsen (Tyler Mane) receives an urgent phone call and takes his nephew and fiancee and makes the journey home to his only other living relative: his estranged, eccentric (and extremely paranoid) father, Gary (Muse Watson), who is obsessed with building an unassailable compound. Once they arrive at Gary’s modest home, surrounded by acres and acres of grounds full of cameras and other security sensors, Michael is surprised and concerned to learn that his father is in the early stages of dementia. Over the course of the first 24 hours, through a string of odd occurrences, some of them almost unexplainable, Michael begins to believe that Gary is a danger to both himself and others. But it turns out Gary isn’t as crazy as he seems. Will the family compound stronghold that was designed to save them be their everlasting tomb? Hot Springs International Horror Film Festival VIP Pass holders get in free to private meet and greet at midnight.